Here’s my list. After a few weeks of thought, a few films stand far above the competition. One of the best experiences of my life. Great films, great friends, and excitement about the future all resulted from a great week of Sundance style rebellion. *keep in mind, these are out of the 19 films I saw (over 80 screened at Sundance). This a few days late, and that’s because getting back to LA has been a whirlwind (including a lovely 12 hour drive). The last day of Sundance was fantastic. It started slow, but came to a wonderful finish as we got to see the Grand Jury Prize Dramatic Winner of Saturday night, just minuted after it was announced. Check out the reviews. A Best of Sundance list will be here soon. On Saturday night I anxiously awaited the announcement of who won Sundance’s Grand Jury Prize. I had tickets to see a screening of the winner, but had no clue who had won. When the winner was released I was so excited that it was Winter’s Bone. I had heard great things all week. Let me tell you: It did not disappoint. Winter’s Bone plays much like a gangster film, instead trading the big city landscape for the impoverished areas of the Ozarks. The performances were all astounding and incredible (the best of the week), and the story featured a strong female protagonist with her eyes set on providing for her young sister and brother. The closing moments of the film solidify this film as a fantastic independent film, and one of the best Sendance 2010 had to offer. Hopefully this film will appear in theaters late summer. I was hesitant about this film, at first. Turns out I was right. This foreign film about healing was not my cup of tea. The editor held on a shots for far too long. With very little dialogue the movie drags and drags on. I can’t hate it completely because as I write this 4 days after, I am still trying to figure out what the director is saying about healing and how we deal with it. The directorial debut of Philip Seymour Hoffman presents a story about a relationship, a simple seemingly boring relationship. But it thrives off supporting actors who are in a relationship that is ending, as Philip’s character and Amy Ryan’s character’s relationship is beginning. The way the scenes are set up you can tell it was based off of a play. At the end off the movie you feel disappointed but you have a smile on your face. I had high hopes for this flick. With a Texas director, directing a story set in 1980s Texas, what’s not to like? This was the most disappointed film of the week for me. Poor performances and poor direction were too much for this film to overcome, despite the wonderful production design. Right now, I’m writing a short film set in a 1970s roller rink (drastically different than this one). Let’s hope my film stands far above the level of Skateland. Probably the biggest movie coming into Sundance. A hilarious comedy follows Jonah Hill’s character Cyrus who has a very close relationship with his mother played by Marisa Tomei. Enter John C Reilly. Thus an awkward love triangle beginsfor Marisa’s affection. The all star cast works seamlessly together thanks to the Duplass brothers’ direction, which left room for improvisation. Visually speaking, There were too many zooms, taking me out of the moment, but overall it was a great hilarious movie. Sundance is winding down, but the last weekend has been full of cool experiences. I have yet to see a bad film, and the week remains strong. America Fererra sat two rows in front of me during Blue Valentine. Before the screening started, I looked over as Adrian Grenier (star of Entourage) walked right past. Seems like the big names are starting to come back in for awards weekend. Looking forward to my last day at the ‘dance. This is the story of a couple falling out of love. Cianfrance directed this low budget film flawlessly. This is the best narrative film at Sundance, thanks to the heartbreaking story and the incredible performances of Ryan Gosling and Michelle Williams. The film broke my heart apart. Cianfrance used contrasts (one of my favorite storytelling devices) to show the condition of the couples’ romance (or lack of). The story is contrasted with a parallel story that tells of how they first fell in love. The contrast between past and present were photographed in film and digital, respectively, and the production design features a wonderful color pallete that compares to the two different times. The soundtrack (courtesy of indie band Grizzly Bear) is both stirring and haunting. See this movie. But here is a warning: you may walk away as heartbroken as the characters within the story. Mark Ruffalo’s directorial debut is a great first effort. Featuring a stellar cast of big Hollywood names (Orlando Bloom, anyone? ), the film is about a paralyzed DJ who gets the power to heal everyone but himself. Ruffalo says that the story is about “a man getting what he needs, not what he wants.” What a theme, right? Well, it is definitely visible in the film, but the story falls just short of fully investigating the theme. Writer Christopher Thornton does an adequate job with his pen, and excels in his perfomance of the lead character, Delicious. I’m looking forward to seeing this film again. Could be better after a second viewing. First time Writer/Director Josh Radnor also stars as Sam in this romantic comedy with a lot more heart that your typical crappy rom-com. With a well rounded cast Josh brings together a compelling story that centers around Sam and a foster boy who he finds on the subway. The boy played by newcomer Michael Algieri was fantastic as the catalyst for change in Sam’s life. Night Catches Us is a good movie. Great? No. I wanted alot more. The performances are all above average, but the story lacks tension. When one of their family members joins the Black Panthers in 1976, a family is forced to deal with the consequences. I wanted to witness more about the Black Panthers. Instead, we get a story about a family on the outside looking in. By the time the influence of the Black Panthers begins to take effect, the story is nearing the final act. 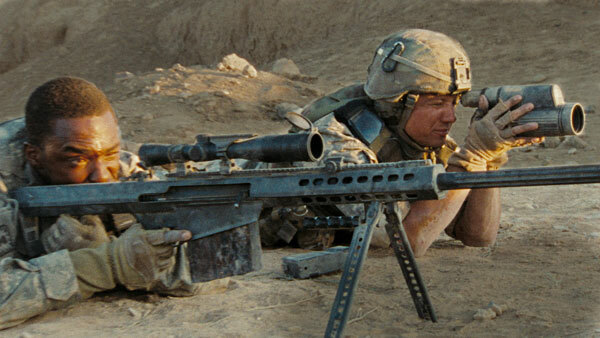 Anthony Mackie (The Hurt Locker) once again delivers a top-notch performance. High marks to the production design team, and cinematographer. One last note: Jimmy Fallon’s late night band The Roots provided a perfectly fitting score. More reviews coming late today! Yesterday was the best day of films so far. Saw an incredible documentary and some great narratives. Not only did we see some great films, but we got to experience a midnight screening. If you havn’t heard of the Sundance midnight screenings, they are dedicated to fun genre films (thrillers, horror, and comedy) and feature dynamite crwod reactions and involvement. It was the single best movie going experience I’ve ever been a part of. Right now, I’m literally 10 yards from Mark Ruffalo, whose directorial debut premiered this week. I’ve heard his film, Sympathy for Delicious, is fantastic. Looking forward to another great day in Park City. Critics have been mixed on Susser’s directorial debut. Some don’t see much of a story. Well I did. Susser crafted an unforgettable character and Joseph Gordon Levitt gives a fantastic performance as the title character. It’s rare for a director to be able to craft a story around a child protagonist. The angst of Devin Brochu’s performance as the main character carries the film, and he plays a lifelike junior high student struggling to deal with the loss of his mother. Natalie Portman and Rainn Wilson play supporting players, and both provide good performances. The film is an examination of grief, and how humans hide it. Grief stands as the elephant in the room in the film, and the thematic density of the film relies on the character of Hesher. Without giving anything away, the emotional core of the film is rooted in Hesher. See this film. It’s a fun ride, but in the end, it will hit you like car. A comedy in London following an Indian mother who takes her obsession with her daughters marriage into the world of serial murder. A rather enjoyable movie, it would have been easy to forget except for a hilarious death scene that catches you off guard. It would be very hard to bring this to an american audience who doesn’t understand the culture and the humor in that culture. This was a stirring documentary about the hazardous practices in which natural gas companies go about removing the gas from the earth. Hydraulic fracturing is contaminating the nation’s underground water sources. The effects of the chemicals used in this process and the natural gas are a serious hazard to humans, animals, and the environment. This is the best documentary I have ever seen, because of Josh Fox’s wonderful revealing story. The narration is infused with humor, as Fox presents indisputable evidence of the fracking’s disastrous effect on America. He even holds a lighter up to a water faucet, and after several moments, flames erupted. Fox presents many more examples, and displays the bipartisan nature of the issue. This is unflinching, unrelenting, and unbiased storytelling. The best film I’ve seen at Sundance. We follow Jesse Eisenberg as he falls away from Messianic Judaism. He is leaving his family and culture behind as he is tempted by money and ends up smuggling extasy into the country. A great and truly honest film that speaks truth to a world who values the sin our protagonist falls into. No matter what religion you follow it is interesting to see the spiritual journey and how anybody can relate it to their own journey. Shot in 20 days. We witness the skill of new comer Director Kevin Asch in his debut film. More reviews coming later today! Great second day at the dance. We saw some good films, one that disappointed, but all three were enjoyable. Spotted Oscar nominated actress Melissa Leo at a screening of of one of her two films (The Dry Land, Welcome to the Rileys). Starting to grow quite fond of this place, and it will be difficult to leave Sunday. Seen 8 films in two days, so this is alot like paradise for me. Right now, sitting at a private Q&A for The Dry Land with cast/crew. Ryan Piers Williams’ story of a soldier returning home from Iraq, is both gripping and visceral. James, the soldier, immediately begins suffering from post traumatic stress disorder, and the film is his journey through this condition. The visceral story is reflected in the handheld cinematography which adequately shows west Texas and plunges us into the character’s world. The performances are decent, although Wilmer Valderamma supporting performance is well above average. The story is good, but too similar to the many war dramas released recently. Maybe I am just tired of war movies? The Hurt Locker, Brothers, and In the Valley of Elah all deal with relationships outside of war and the traumas brought on by experiences overseas. I do respect the filmmaker’s intention and think this a good movie that will bring light to much needed changes in how the military handles and cares for our soldiers. After all, they are fighting for US. Imagine you are in a box 6 feet in the ground, and no, your not dead. Yet. You are Ryan Reynolds a truck driver in Iraq help for ransom. We follow Paul and the camera never leaves him: the whole movie is inside the coffin. The cinematography was riveting with such a complex set ups, some camera moves seemed impossible. The lighting was so realistic with 4 practical lights including a lighter, cell phone, glow stick, and a flashlight. The way these were used was very creative and very dramatic. Unfortunately the film as a whole is lacking. Its novelty is also its downfall. We stay too long in the coffin and it would have worked better as a short film. It is a great thrill ride that keeps you on the edge of your seat (sometimes). But I wish I could have walked away with something. Instead, I left empty handed. This poorly photographed film is without a doubt my favorite film at Sundance so far. Many could describe it as an ugly film, and that wouldn’t be far from the truth. What is incredible about this film, is not technical, but rather in the narrative. The film is an entirely original story exploring the relationship of two brothers and how they tear down the wall that stands between them. The protagonist, Sam, is an interesting study in identity and what people choose to hide or reveal to one another. The film features hilarious performances and dialogue, which kept the audience entertained throughout. Technically awfully, but beautifully written and acted, Douchebag is a must see if it finds a distributor. What an experience thus far! Seen some great films so far, and the vibe of Sundance is like nothing else. Ran into a few celebrities during our strolls around Park City (Samuel L. Jackson, Diego Luna, Jonah Hill). This city is a beautiful place where high and low culture join together around the common bonds of filmmaking. Looking forward to a great week. Even ran into director Jay Duplass (director of Cyrus, starring John C. Reilly) in line for Daddy Longlegs. Really great guy who encouraged me to skip his film, and see the films I can’t see in theaters. We arrived at Sundance 7 hours before our check in time with our group so we decided to try and catch a film. We wait listed and got tickets for Animal Kingdom, a superb crime drama following a family in Melbourne Australia. We follow the moral decay of “J” who moves in with his criminal relatives, following the death of his mother. He is a blank canvas and this new family abuses that innocence. They had a fantastic cast and it was shot beautifully. Through J’s journey, we discover that animals lie on both sides of the law. It is also an interesting examination of truth, and how humans develop truths for themselves, which may be right or wrong. Only complaints would be that the film was too long and one characters story line entirely disappeared. Mixed reactions resulted from this film (a product of this year’s Cannes Film Festival). Some loved it, others didn’t. I happened to love it. It’s a humorous and tragic tale of a divorced father who gets two weeks a year to spend with his kids. The father excels at being a fun dad, but fails to be the kind of parent his kids need. This film examines a tragic hero who fails despite good intentions. The performances were all stellar, and the story structure (or lack of) brings freshness to a story based on the directors’ own experiences with their father. The story sparks from how they remembered feeling in these moments, rather than their opinion of their father now. See this film if you get a chance. It should be on Video On Demand. Obseledia was our second film of Sundance, and I was excited for the visuals because I knew it was shot on the RED One. The story was intriguing: a man writing the encyclopedia of obsolete things on his typewriter (Obsolete+Encyclopedia=Obseledia). He believes love is obsolete and you think this is the driving force, but then it is abandoned for a global warming presentation , before returning to the love plot. I had a chance to talk to the fantastic cinematographer afterwards and asked “Why shoot on the RED when you’re making a movie about obsolete things?” (since the film world is in this debate of film vs. digital). Unfortunately the budget didn’t allow for it, but it was visually compelling none the less. Wow. During this documentary, you laugh all the way through, and by the end realize, “Whoa. I actually learned something.” The sequel in the making for 25 years, this addition embraces 3D technology to astounding success. Although I am not a believer in 3D, I am now, for nature docs. Masterfully directed, Toads is structured using interviews and reenactment that reach levels far above your standard recreations of events. The director asked each person to play a character of themselves (rather than just their normal self) to further the effect of the storyline, which resulted in hilarious moments from beginning to end. I would now consider myself a semi expert on Cane Toads, as the doc proved extremely educational, and presented both sides of the argument without bias. The film turned the toads into lifelike characters with real life emotions, using established eye lines and musical cues. I highly recommend this Australian documentary. Should be a great day tomorrow! I missed a lot due to economic struggles. But that’s okay. I just can’t get enough of it. What better way to end our decade then with a brilliant film about the war that shadowed our generation. Jeremy Renner and Anthony Mackie both give powerful performances and Bigelow’s direction is nothing but perfection. The best war film of this decade that steers away from political opinion and concentrates on the emotional and personal aspect of a faceless combat. Leave it to Tarantino to bring us another boldly insane compilation of history, art, and violence that may be the most entertaining film this year. Unpredictable as always, Tarantino jumps between storys, arranging them like puzzle pieces and connecting them in the end to an explosive climax that rewrites history. Points also go to one of the most intelligent villains in film history. …and Pixar continues to dominate the animated world. No surprise with another original outing that introoduces more hilarious characters interacting with beautiful animation. Not only is it a comedy but also touches on mature subject of human loss and the weight of our personal goals. 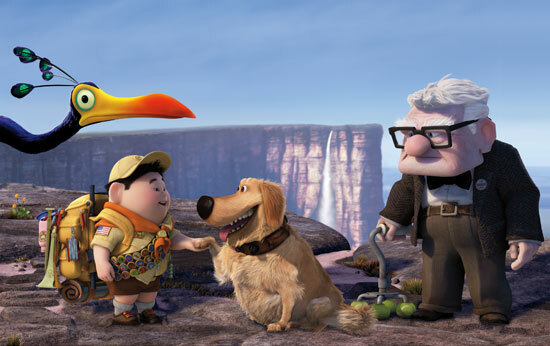 Where many kids’ films fail, Up succeeds in every way. Jason Reitman has proved himself to be one of the brightest new directors to emerge from the past decade. This one can easily be marked as his best film to date. With Clooney’s charm and Reitman’s direction, Up In The Air uses the crumbling foundations of our fears and economic struggles to tell a story about human connection and the dire need that we sometimes forget. Nobody does dark comedy quite like the Coens and this one is just as incredible as Fargo and No Country For old Men. 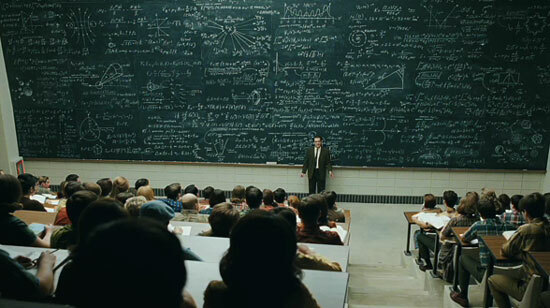 As much of a study of a man’s degradation as it is of Jewish culture, A Serious Man has a dark agenda for its viewers as well as its characters. The last shot is a killer. 2009 was a great year for science fiction. Newcomer Blomkamp had an original concept and he used that to create an exciting alien thriller all at the low cost of 30 million. Here’s proof (Michael bay, please take note) that story and execution are the most rewarding aspects in great filmmaking. A thoughtful and intelligent anti-love story featuring some of todays most promising young talent, (500) Days can claim the award for sleeper hit of the year. And it deserves it, for being a clever little film studying the clashes between our generations perspective on the joy, confusion, and pain that comes with it. I’m sure many people’s favorite CGI infested blockbuster this year was Avatar which was a great movie but this one still stands as my favorite. I’m not even a Trekkie (Trekker?). I rarely watched the show but this movie contained every amounts of fun and excitement a blockbuster should contain. Colorful characters, incredible effects, and a sharp script, we were spoiled this summer. Lets face it, the 2000s was a terrible decade for horror. It wasn’t until the end that the masterful Raimi broke away from his silly superhero genre to give us one of the most awesome descents into the genre since his Evil Dead trilogy. Funny? Scary? It’s both and it’s one hell of a ride. Pun intended. My most controversial pick here. Say what you want about this dark film, there is no other comedy quite like this one (and don’t you dare say Paul Blart: Mall Cop). I loved this movie for it’s careful attention to it’s characters and the social destruction it creates as Seth Rogen’s (in his best performance to date) mall cop Ronnie breaks the definition of “off your meds.” It may make you laugh or it may just disgust you, but if you think Observe and Report is another mindless, crude, potty-mouthed comedy, you are dead wrong.